Lawrence Paul Yuxweluptun and I are standing in front of his monumental 1991 painting Scorched Earth, Clear-cut Logging on Native Sovereign Land. Shaman Coming to Fix – one of the (many) highlights of his exhibition at the Museum of Anthropology in Vancouver – when he reaches over and grabs the glasses from my face. “Those are your glasses, right? I have them, they belong to you. I’m using them, they’re yours. They’re in my possession, you own them. I’m benefiting from it, but they’re yours,” he says, in a prolonged analogy where my glasses stand for the land, I am the First Nations and he is the government – the thief holding my property. Yuxweluptun explains his points with a raised voice that echoes through the galleries and quiets the weekday crowd taking in the show. They stop, creep closer and listen as he pronounces on missing and murdered indigenous women, the Mount Polley mine disaster, pipelines, Stephen Harper, the current British Columbia government and the relationship between environmental devastation and corporations. The opening last Wednesday night for Lawrence Paul Yuxweluptun: Unceded Territories attracted 2,000 people – making it the largest opening in MOA’s history. It is a stunner of a show that places Yuxweluptun’s provocative ideas in the spotlight along with his powerful paintings. Born in Kamloops in 1957, Yuxweluptun, who lives in Vancouver, is of Coast Salish and Okanagan descent. He is an outspoken critic of the status quo – specific examples include the Indian Act, the land-claims process, pipelines and governments that support them – and these ideas are central to his practice. He believes the name of British Columbia should be changed to reflect its pre-contact history and suggests, as a joke, the province of Traditional Native Territories instead. An Indian Game (Juggling the Books) (1996). “Which, abbreviated, would be the province of TNT,” he says with a laugh. He also pronounces on the province’s current government, the BC Liberals and its leader, Premier Christy Clark. 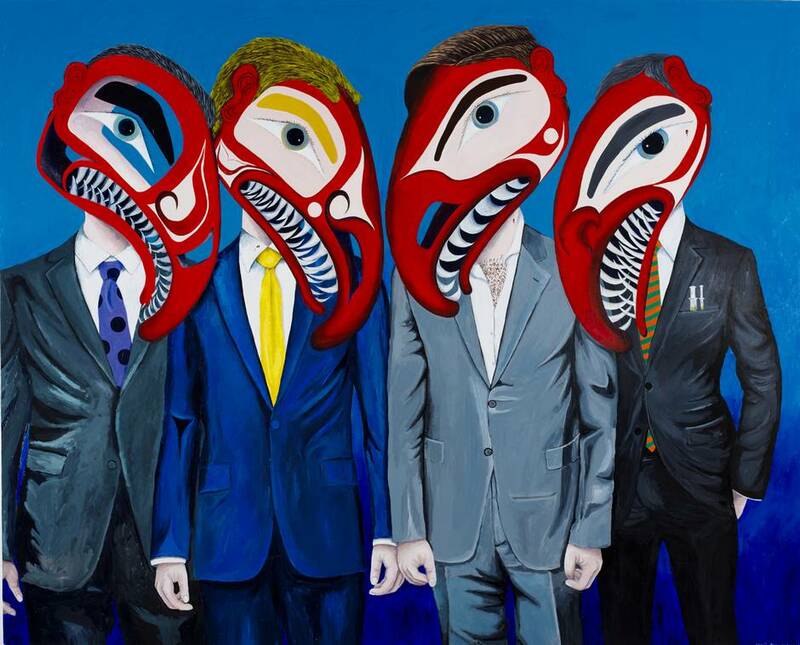 In the 2015 painting Christy Clark and the Kinder Morgan Go-Go Girls, three masked women stand side by side – Clark, in the middle sports a navy pantsuit and pearls, but also long, sharp red nails/talons and a forked tongue. Yuxweluptun may be a tough critic of the establishment, but the establishment seems to love him. Perhaps it’s the beauty and whimsy with which the unapologetic messages are delivered. 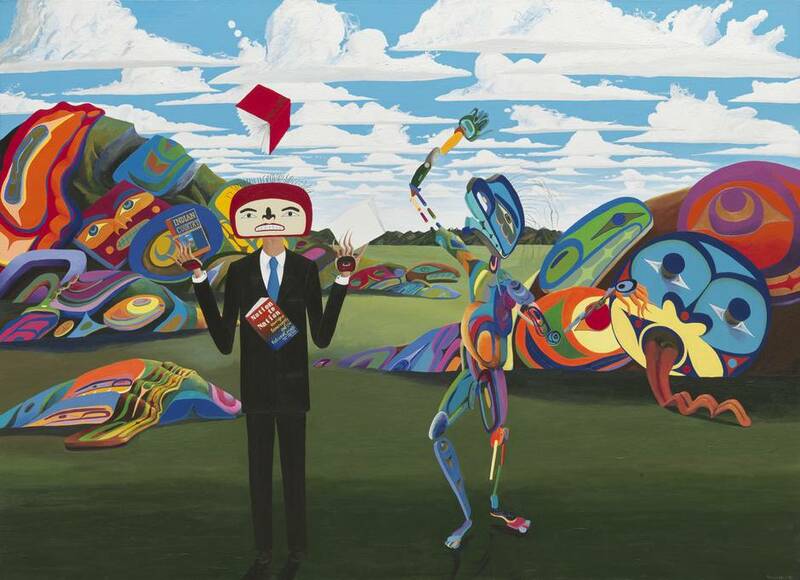 It sold for $100,000 at a Vancouver Art Gallery fundraising auction last month. Up close, little details in these large paintings can be observed. The lab-coat-sporting scientist hoisting another on his shoulders hands the guy on top – who is trying to replace the hole in the sky with a patch of blue – a screwdriver. In another environmental work, Killer Whale Has a Vision and Comes to Talk to Me about Proximological Encroachments of Civilizations in the Oceans (2010), a whale emerges from the polluted ocean to tell the artist that the oceans are dying. 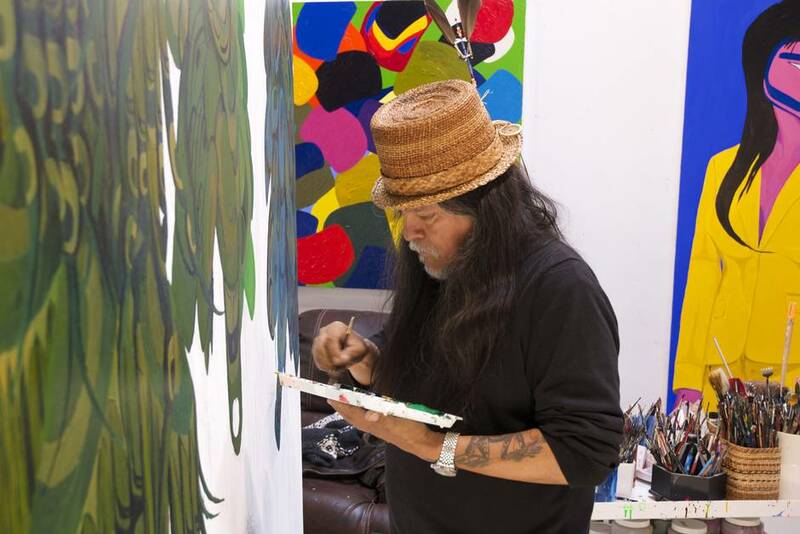 The show traces Yuxweluptun’s work over more than 30 years; the oldest work is his 1984 pioneering pop-art painting Haida Hotdog – the ovoid frankfurter a commentary on mass production of Northwest Coast art. Fish Farmers They Have Sea Lice (2014). The most recent piece is the enormous Spirit Dancer Dances Around the Fire, completed this year and what Yuxweluptun calls a religious painting. Like the 1991 work Night in a Salish Longhouse, the work depicts the sacred space of the longhouse in illuminated tones against the dark interior space, reminiscent of European religious art. Yuxweluptun is a tremendous painter, but perhaps the most powerful piece in the show is the mixed-media installation Residential School Dirty Laundry (2013) – a large crucifix on the floor formed out of hundreds of pairs of white children’s underwear, some splashed with a substance meant to resemble blood, with a ceramic cross in the centre and the inscription “For this child I prayed …” (1 Samuel 1:27). The show is particularly powerful in the context of this museum, filled as it is with art and artifacts made by indigenous people. Yuxweluptun himself has also publicly criticized MOA – often calling it an “Indian morgue,” as the show’s co-curators note in their catalogue essay. Lawrence Paul Yuxweluptun: Unceded Territories is at MOA at the University of British Columbia until Oct. 16 (moa.ubc.ca).